The top airline among travel agents selling leisure travel will begin operating its new flight during the next winter season. Canadian airline Sunwing will begin operating its new seasonal flight from Quebec to the Puerto Vallarta-Riviera Nayarit region during the next winter season. 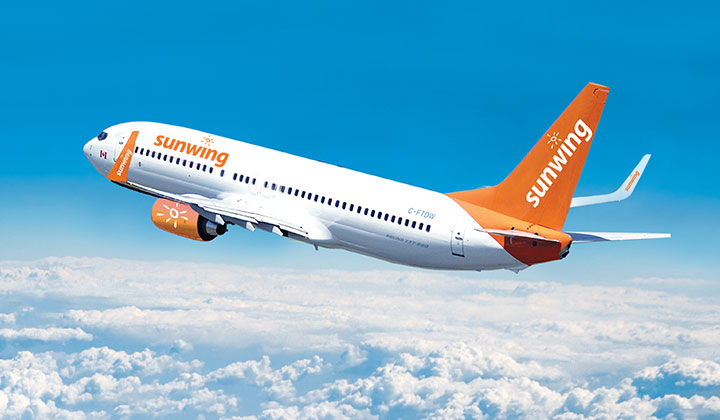 According to Sam Char, executive vice president of Sunwing Travel Group Quebec, the new route will begin operations on December 17, 2018, and conclude on April 15, 2019. He stated this initiative will connect the Canadian market with the region of Puerto Vallarta and the Riviera Nayarit. “Puerto Vallarta and the Riviera Nayarit are always popular as vacation destinations and we’re sure this new service will be very welcome,” he added. The announcement was made after an intense promotional tour carried out by the Riviera Nayarit CVB and the Puerto Vallarta Tourism Trust during the month of May throughout the top Canadian cities of origin to the destination. Sunwing—the top airline for travel agents focused on the leisure market—currently operates 19 direct flights from 11 Canadian cities to this region during the winter season. For its part, Sunwing Travel Group offers an ample variety of resorts within the Riviera Nayarit, among them, Iberostar Playa Mita, RIU Jalisco and Grand Palladium Vallarta Resort and Spa. These are not only high-quality resorts, but they also provide their guests with a gamut of culinary options and a long list of leisure activities. “This new flight promotes the arrival of more Canadians to the region, reinforcing the presence of the Riviera Nayarit in one of North America’s most important markets,” commented Marc Murphy, managing director of the Riviera Nayarit Convention and Visitors Bureau. Sunwing Airlines is a subsidiary of the Sunwing Travel Group, the parent company that operates like a travel agency and is the largest of its kind in Canada. Beginning next winter, the airline will connect Quebec with 10 of most popular destinations in Mexico, the Caribbean, and Florida. The Riviera Nayarit Convention and Visitors Bureau (CVB) and the Bahía de Banderas Hotel and Motel Association (AHMBB) reaffirm their commitment to the strategic promotion of the destination, pursuing areas of opportunity and consolidating new markets to increase the number of incoming tourists, together with the support of the Government of the State of Nayarit via the Tourism Promotion Trust (Fiprotur).